How to Reduce Apparel Production Cost in Garment Industry? 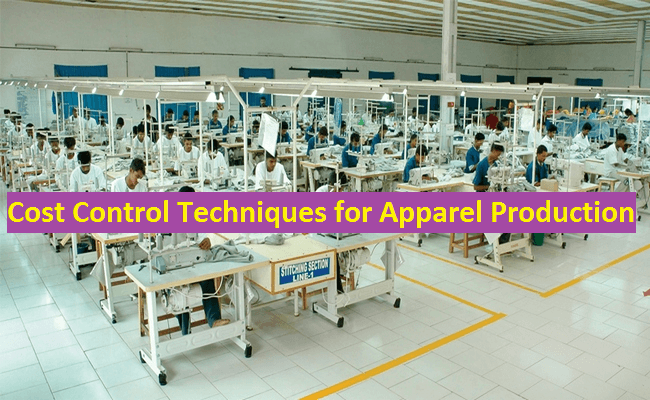 How to Control Apparel Production Cost in Readymade Garment Industry? In readymade apparel business, cost control or cost saving of apparel production plays an important role in the total profit percentage of an apparel export order. This article has shown a lot of techniques or tips for cost control in apparel production. Proper maintenances of machineries and equipment’s should be done systematically and continuously with proper scheduling. Effective and efficient production planning which will reduce the unnecessary stoppages of machines and idleness of employees. It increases the machine efficiency. Providing periodical training to the employees at all level about various latest technologies, new and innovative methods of production and control etc. will improve the effectiveness and efficiency of the work. Unnecessary overtime should be reduced. Employing skilled and experienced labors will increase the apparel production, reduces the defective products etc. Proper handling of various materials, equipment’s and machines should be carried out. Proper allocation of work to various resources like man, machine, money etc. should be done. Reduce the unnecessary movement of materials by employing proper layout and process sequence in the clothing manufacturing process. Implementation of integrated production system will reduce the different wastages and costs. Effective and efficient supply chain management should be done through using ERP (Enterprise Resource Planning) system. Development and implementation innovative system or methods in the various activities in the apparel manufacturing process. Efficient and proper utilization of various resources such as waster, steam, power etc. Establishing standards and specification for various materials and methods. Getting certifications like ISO 9000, SA 8000, OHSAS, ISO 14000, WRAP, Oeko-tex etc. Implementation of various total quality management concepts and tools like PDCA, Kaizen, 5’S, Bench marking, BPR, Quality circle etc. Using modern machines and equipment’s for manufacturing will give good quality, more production, less wastages and also they require less manpower. Optimization of material requirement by using quantitative techniques. Effective monitoring and control system for the use of miscellaneous resources like power, telephone, stationaries etc. Outsourcing of various activities which needs special attention or in which the company is not having much expertise. Providing proper ergonomics and essentials of working circumstances in the company by keeping proper, clean and neat working condition. Establishment of systematic communication system which will provide proper information to the right person in right time will reduce the wastage, stoppages of machines etc. Effective inventory control in stores and purchase will reduce the ordering cost, carrying cost of different incoming materials. Very nice ….. Pls send always …..